Powers/Abilities: Horst Eisele wore a power vest which protected him from harm, enhanced his strength, and permitted him flight. 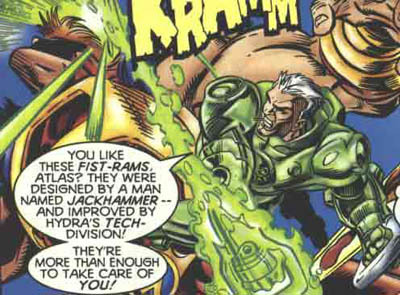 He also wore copies of the Fist-Rams wielded by the HYDRA agent Jackhammer, allowing him to pound with superhuman force. History: (Thunderbolts I#0 (fb) - BTS) - Horst Eisele was a notorious assassin who served under El Jaguar when he was a HYDRA section chief. He was known of by the Fixer, and could be recognized by his scar. Over the years, he worked his way up in rank within HYDRA, eventually becoming a section chief himself. (Thunderbolts I#0)- After the Crimson Cowl vowed to notify the Thunderbolts' enemies of their whereabouts, they began by telling HYDRA, and Horst Eisele led an assault upon the Thunderbolts at the Mountview Grill restaurant. With his duplicates of Jackhammer's weapons, Eisele was able to pound away at Atlas while leading his men to defeat the other Thunderbolts, but when Hawkeye entered the fray, he was able to rally his teammates and brought Eisele down with a sonic arrow. 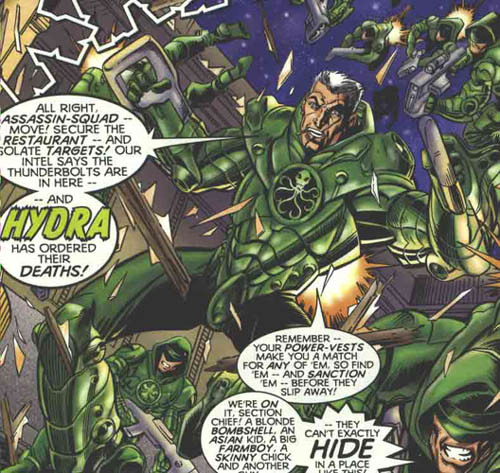 In order to prevent HYDRA from coming after them again, Moonstone pretended to have psychic powers, and claimed to have absorbed all of his knowledge, forcing Horst to stand down. Comments: Created by Kurt Busiek, Mark Bagley and Al Milgrom.